NEW YORK (AP) — An armed man walked up to two New York Police Department officers sitting inside a patrol car and opened fire Saturday afternoon, shooting both of them fatally before running into a nearby subway station and committing suicide, police said. The shooting took place in Brooklyn's Bedford-Stuyvesant neighborhood. Both officers were rushed to Woodhull hospital, where one was pronounced dead, police said. The second officer was later pronounced dead at the hospital, according to a senior city official and a law enforcement official with direct knowledge of the shooting. They were not authorized to speak publicly and spoke to The Associated Press on condition of anonymity. Authorities say the suspect fatally shot himself inside the station. His motive wasn't immediately clear. The NYPD has scheduled a news conference for 7 p.m. with Mayor Bill de Blasio to discuss the shooting. A block from the shooting site, a line of about eight police officers stood with a German shepherd blocking the taped-off street. Streets were blocked even to pedestrians for blocks around. Derrick Thompson, who lives nearby, said the shooting happened across from the Tompkins Houses public housing development. "I was watching TV, and then I heard the helicopters," Thompson said. "I walked out, and all of a sudden — this." The shooting comes at a tense time. Police in New York are being criticized for their tactics following the chokehold death of Eric Garner, who was stopped by police on suspicion of selling loose, untaxed cigarettes. Amateur video captured an officer wrapping his arm around Garner's neck and wrestling him to the ground. Garner was heard gasping, "I can't breathe" before he loses consciousness and later dies. 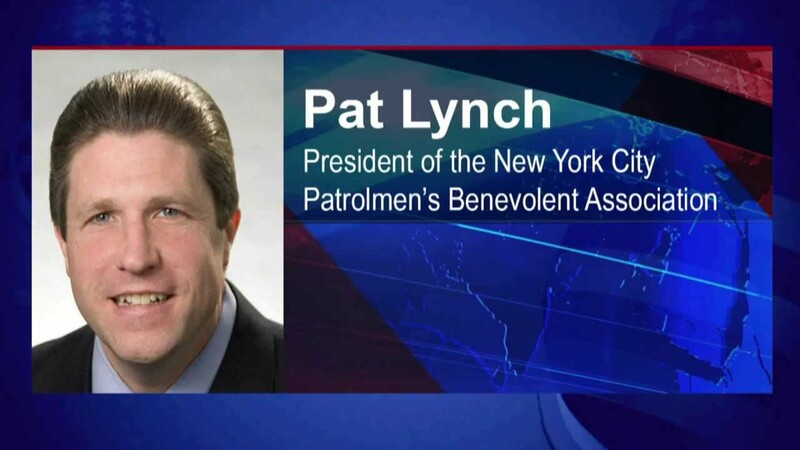 The president of the police officers union, Patrick Lynch, and de Blasio have been locked in a public battle over treatment of officers following the grand jury's decision. Just days ago, Lynch suggested police officers sign a petition that demanded the mayor not attend their funerals should they die on the job. The last shooting death of an NYPD officer came in December 2011, when 22-year veteran Peter Figoski responded to a report of a break-in at a Brooklyn apartment. He was shot in the face and killed by one of the suspects hiding in a side room when officers arrived. The triggerman, Lamont Pride, was convicted of murder and sentenced in 2013 to 45 years to life in prison.